Demonstratievideo. Ba Duan Jin is een meer dan duizend jaar oude traditionele Qigong vorm, die bestaat uit acht dynamische oefeningen. Van oudsher maakt deze vorm deel uit van de training voor de monniken van het Boeddhistische Shaolin klooster en de Daoïstische kloosters in het Wudang gebergte in China. Ba Duan Jin maak het lichaam sterk en soepel, helpt heel goed bij nek, rug en schouderklachten, opent de meridianen, reguleert en activeert de Qi stroom in de hoofdmeridianen en voedt en masseert de organen. Verder draagt Ba Duan Jin bij aan het voorkomen van ziekten, het versterken van het immuunsysteem en het bevorderen van de algehele gezondheid en een lang leven. Gedemonstreerd door Peter Smit. Video is digitaal verkrijgbaar als mp4 bestand. Breng je organen en emoties en in balans en vergroot je gezondheid met de kracht van klanken. Qigong meester Yuan Tze heeft 12 CD’s gemaakt, die je ondersteunen om op een goede manier Zhineng Qigong te beoefenen. Yuan Tze geleid je verbaal en in detail door alle belangrijkste Zhineng Qigong oefeningen en vormen op een diep niveau. Op harmonieuze en vloeiende wijze worden de woorden van Yuan Tze door zijn vrouw Melissa Kung Liu in het Engels vertaald. Met oog op het milieu zijn de CD hoesjes van papier gemaakt. ﻿Bekijk de inhoudsopgaven van deze CD's door hier te klikken.﻿ Heb je meer vragen over de inhoud van de CD’s, neem dan gerust contact op. De CD's zijn compleet en individueel te koop. Zie hieronder het assortiment. ​De voorraad is beperkt, want deze CD collectie wordt niet meer opnieuw gedrukt door Yuan Tze. OP = OP! Qigong master Yuan Tze has produced twelve audio CD’s, which support you to practice Zhineng Qigong in a good way. 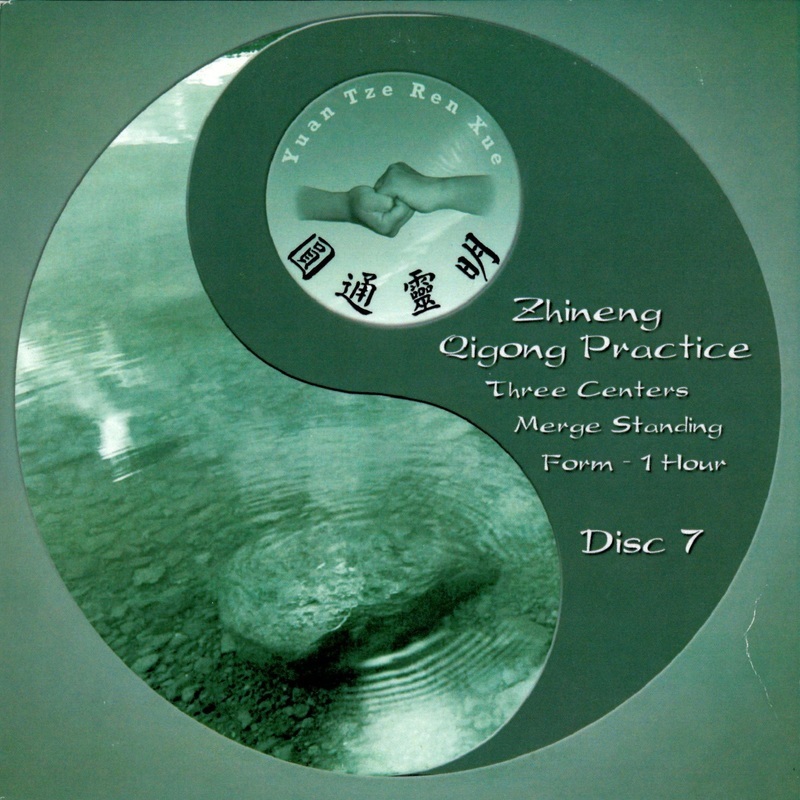 Yuan Tze guides you in detail through all of the main Zhineng Qigong practices on a deep level. In a very harmonious en smooth way the spoken words of Yuan Tze in Chinese are accompagnied with English translation by his wife Melissa Kung Liu. By concern for the environment the CD sleeves have been produced in paperboard material. For the index of the CD's click here. For more information and questions about the content of the CD’s please feel free to contact us. CD's are as collection or as loose items for sale. See below for the collection. Inmiddels zijn alleen CD 1 en CD 2 nog verkrijgbaar. Overige Cd's kunnen nog wel als mp3 gekocht worden. By now only CD 1 en CD 2 are still available. Other CD's can be purchased as mp3 audio file. The four basic excersises are Squats, Stretching Qi (Chen Qi), Bow body, Rotate hips and Curl weilu. The last three are taken from the Body&Mind form. They have been especially put together by Yuan Tze through years of teaching and clinical experience and are suitable for beginners as well as advanced practicioners. These excersises enables beginners or those with physical limitations, to make a gradual progression to full practice of methods. Lift Qi Up Pour Qi Down is the first method of the Zhineng Qigong system and works mainly with the external Qi. The goal is to improve our Qi and health by exchanging and gathering Qi from the universe inside the body. The same as CD 1 without the Lift Qi Up and the basic excersises are done a bit longer. Lift Qi Up Pour Qi Down is preceded by Squats and Chen Q to unblock the main Qi channels in the body. Three centers Merge form is a standing meditation, primarily for nourishing Qi in the body. It is essential for building a Qigong foundation and the development of the consciousness. It is also a bridge between the different levels of Zhineng Qigong. It is preceded by Squats and Chen Q to prepare the body to draw Qi inside. The combined practice of these two forms, wich belong to the first level, completing each other and brings the effect of both gathering and nourishing Qi. This method works belongs to level 2 of the Zhineng Qigong system and works mainly with the internal Qi. The essence is to unify Body and Mind in the practice. It brings gathered Qi deeper inside the body, stretch and open joints in all parts of the body and opens the Qi channels. 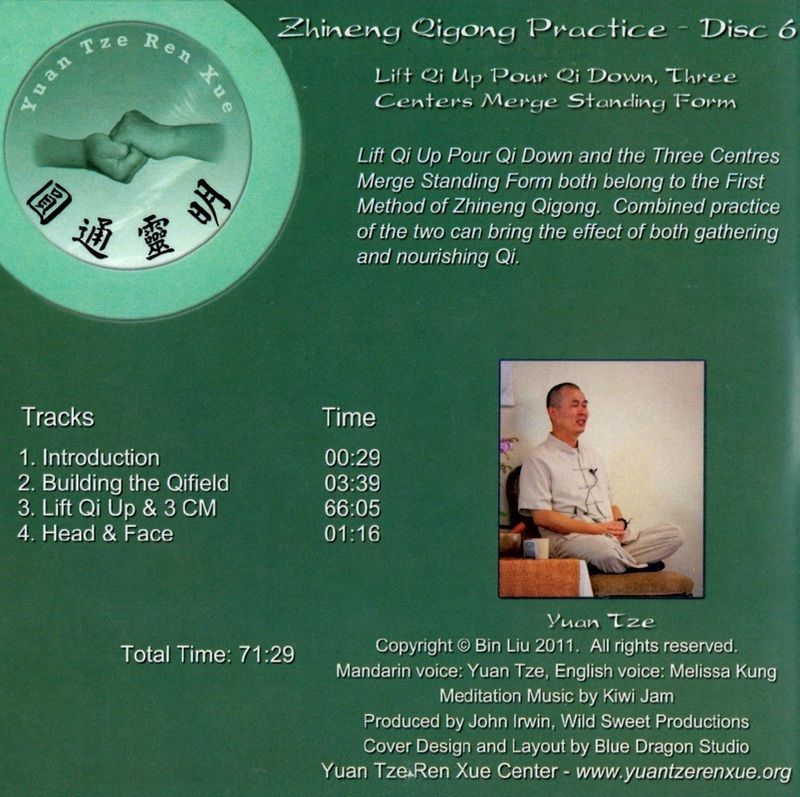 Leading along Jingmai (Qi tapping) is incorporated in the Body and Mind form on this CD. Tapping Qi moves stagnant Qi, bring Qi deeper inside the body and smoothes it out evenly in the body. This form belongs to level 3 of the Zhineng Qigong system. It works on the pure Qi of the organs, strengthen the phyical organs and enable Qi to harmonise with Hunyuan palace, wich is the gathering centre of the pure Qi of the organs. It can also increase the ability to have emotions under control. Open-Close Pulling Qi (La Qi) is a simple but very effective technique using the mind and hand movement to integrate internal Qi and universal Qi, drawing it back to the body to improve our Qi condition. 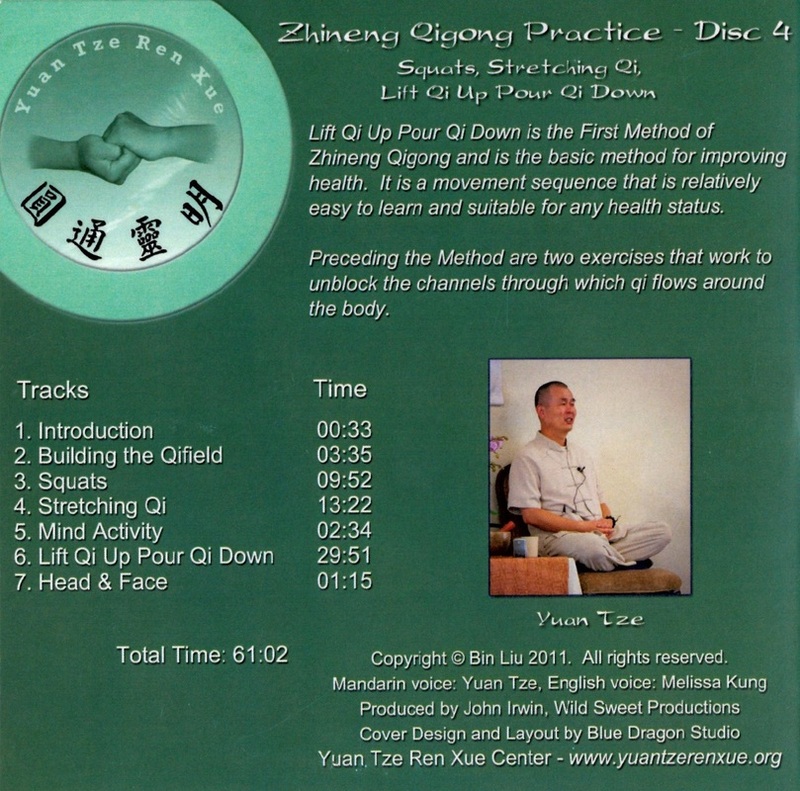 Building a Qifield for Qi Therapy is recorded by Yuan Tze with the use of his special abilities, so it contains strong information and Qi for healing.